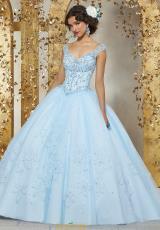 Lovely Vizcaya Quinceañera dress 89229 is a stand out choice for your upcoming party. This gorgeous style has an off the shoulder neckline on a fitted bodice. The bodice is embellished with shimmering bead work and floral applique. The lace up back and basque waistline flatter your figure beautifully, elongating your torso and cinching you waist before expanding into the regal skirt. The full ball gown skirt is a gorgeous layer of sheer tulle which features stunning oversized applique flowers highlighted with shimmering beads. The dress comes with a matching stole.